When Joseph looked down at the tiny infant nursing at Mary’s breast, he saw how vulnerable Jesus was and vowed to protect the baby from all evil forces. Joseph traded his chisel for a sharp dagger but soon learned that King Herod, who had ordered all baby boys killed, had armed his forces with rifles. Being a devoted father and desiring to protect his family, Joseph went forth and bought a rifle too. Every night he slept with it beside him, confident that his wife and child were safe. He feared intruders who would steal his family’s valuables. Understandably, he also hated the Roman government, which occupied the land and oppressed the people. Joseph was prepared for the day when there would be an armed uprising. The couple had more children. To ensure their safety Joseph bought guns for them all, rifles for the boys, handguns for the girls, and set up a target resembling a Roman soldier just outside of the city gates. Being in every way an exceptional child, Jesus, of course, had a sharp eye and an aim that never failed to send a bullet right to the heart of the target. When Jesus grew to manhood he gathered around him a group of twelve men. “It is essential,” he said to them, “that we are able to protect ourselves. There are always thieves along the roads we travel, and of course Roman soldiers set on our destruction patrol the area.” He and the twelve spent hours by Lake Galilee practicing their shooting skills. When Judas returned with thirteen AK-47s, Jesus and the twelve had confidence that these guns would provide the protection they needed. Besides, holding such a weapon and firing it made them feel like real men. It was at about this time that crowds of people began to gather around Jesus. He spoke to them in parables. “One time,” he said, “there was a wealthy merchant. A robber came to his place of business, but the merchant had a gun and was able to kill the robber. Behold, we live in dangerous times when we must protect our families and ourselves. Only with powerful weapons are we safe.” And the crowds believed him. One evening, while some disciples slept and some played cards, Roman soldiers burst upon the scene. Jesus reached for his AK-47, but a soldier kicked it out of his hands. He was taken away. And killed. 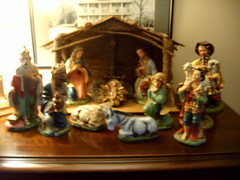 This entry was posted in political and tagged Christmas, gun control, guns, Jesus, Mary, nativity by Nancy Werking Poling. Bookmark the permalink. Isn’t it strange how we glorify Jesus as the Prince of Peace, the teacher of non-violence and love of neighbors and enemies, yet ignore him? We are content to live in a culture of violence and insist on protecting ourselves from violence through violent means. I fear the Jesus we follow is like the one you portray. Thanks for your insight, James. How easily we separate the beliefs we affirm from our true values. Once again through your writing you have called me to remember that this God we worship sent his son to turn our world upside down not giving in to violence and the ways of human nature. This calls me to ask for forgivenss in moving on with my life and not remembering whose I am, a daughter of the Prince of Peace. It seems so contradictory, doesn’t it, that in this holy season our conversation is about guns.